Hey guys! 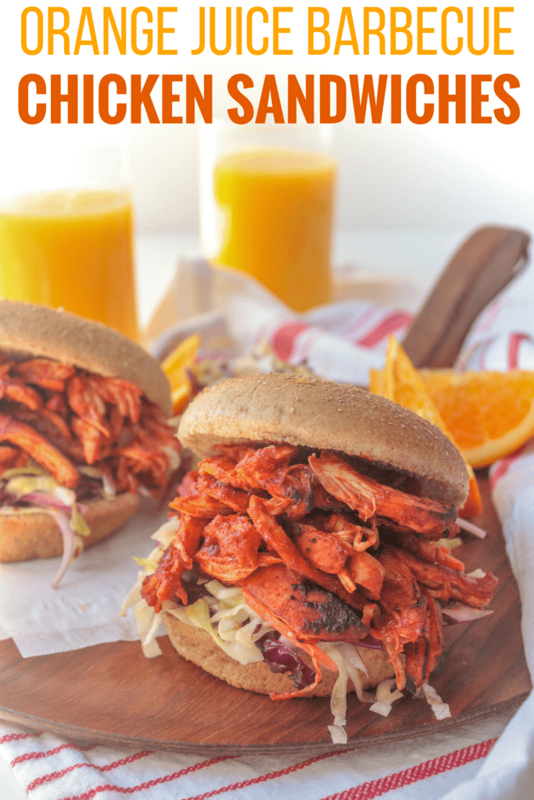 I’m excited to continue my partnership with Florida Orange Juice to bring you the recipe for these delicious Orange Juice BBQ Chicken Sandwiches. Just like all my favorite recipes, this one is quick, easy, healthy, and super delicious. 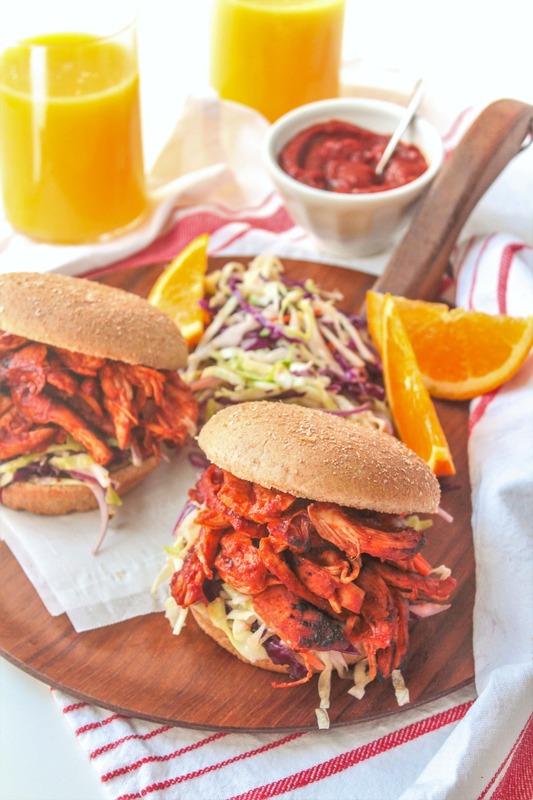 You’ll never want to make barbecue sauce without Florida Orange Juice again! 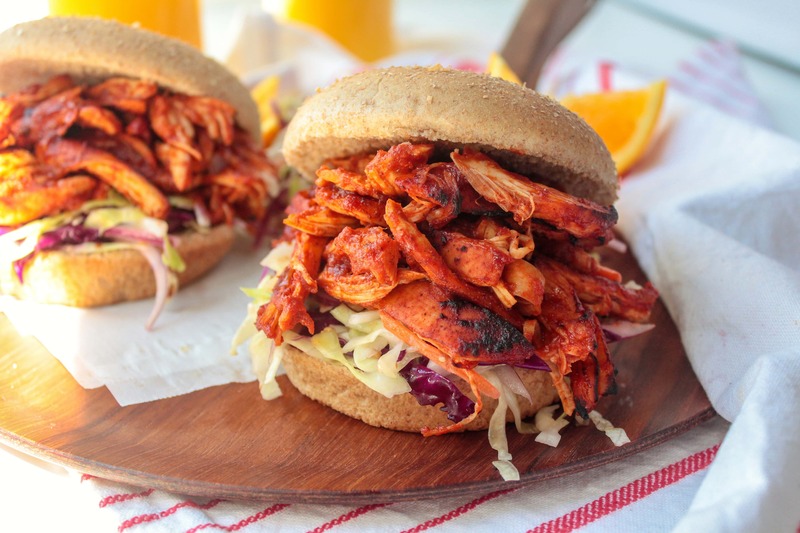 Whether you make these BBQ chicken sandwiches on the grill or in the kitchen, they’re perfect for your next summer cookout or weeknight meal! The tangy citrus flavor from Florida Orange Juice really takes the chicken marinade and the BBQ sauce to the next level! Using 100% orange juice in the BBQ sauce also gives you a slightly sweet sauce without pouring cups of sugar into the pot, and adds a summery touch that you don’t get from most BBQ sauces. The whole meal comes together quickly with just a few steps. First, roast or grill the chicken breasts coated in the smoky marinade, then, once cooked, shred the chicken and toss it in the BBQ sauce. That’s it! If you are using the oven, you can char the shredded chicken under the broiler to get more of a smoky flavor – or skip that step and just dig in. Up to you! The BBQ chicken can be served with various BBQ sides (like slaw – try my watermelon rind coleslaw), or as a sandwich! Either way, I hope you enjoy it. Whole wheat buns, lettuce, slaw, etc. 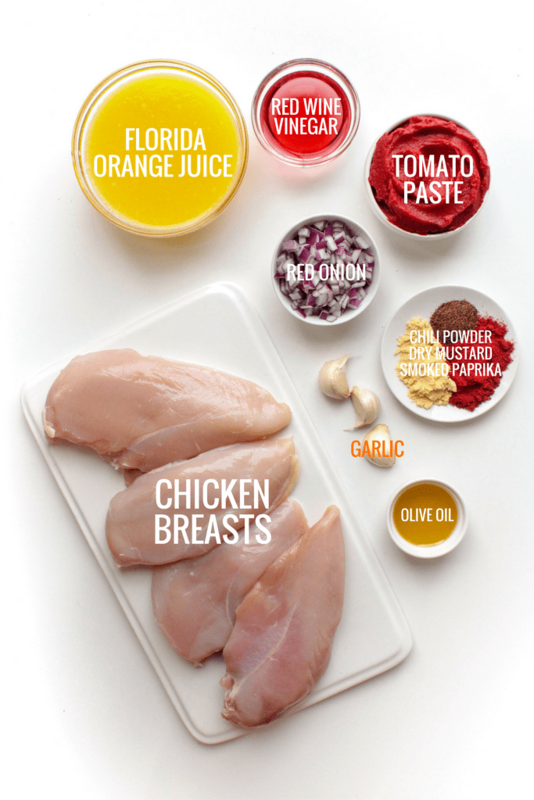 For the chicken: Preheat the oven to 400 degrees, or fire up your grill. Place the chicken, orange juice, and spices in a large bowl and toss to coat. Place the chicken breasts on a parchment-lined baking sheet and bake for about 20 minutes, until cooked through. Or, grill until cooked through. Meanwhile, make the BBQ sauce: Heat the olive oil, red onion, and garlic in a pot over medium heat. Cook 4-5 minutes, until the onion is translucent and the garlic is fragrant. Add the remaining sauce ingredients and bring to a boil. Reduce heat to low and cook for about 20 minutes or until thickened, stirring occasionally. Shred the chicken breasts, pour the BBQ sauce on top, and toss to coat. Use as much or as little sauce as you'd like, depending on how saucy you want the meat. 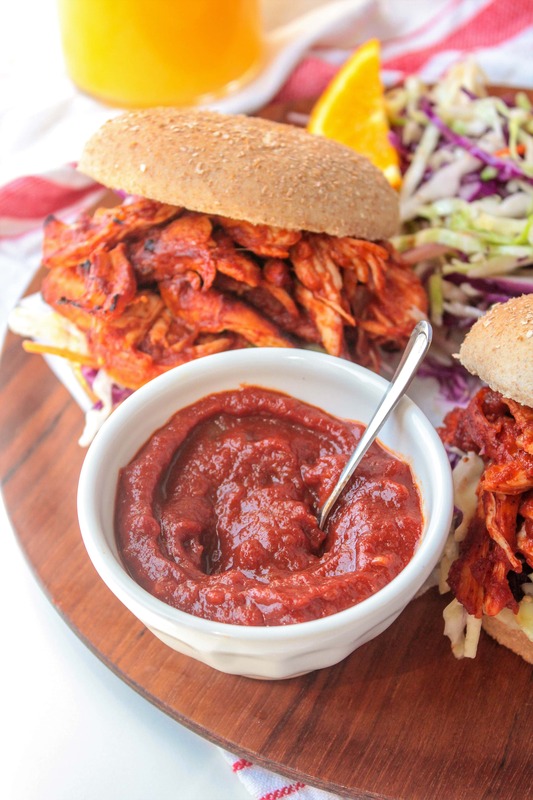 If you are using the oven rather than the grill, you can turn the oven to "broil" and broil the BBQ sauce-coated shredded chicken on a baking sheet for an extra 2-3 minutes to char the edges and let the sauce soak in. Serve on buns with your favorite toppings! If you prefer sweeter BBQ sauce, feel free to add a little honey! You can always cook the sauce without it, then taste it to see if you want to stir in a tablespoon or two of honey for an added touch of sweetness. Thank you to the Florida Department of Citrus for sponsoring this post! Florida Orange Juice provides the amazing 5 in every glass: Taste, Vitamin C, Folate, Potassium and No Added Sugar. Plus, an 8 ounce glass of 100% orange juice counts as one of your daily recommended servings of fruit! Visit their website and follow them on Facebook, Twitter, and Instagram to learn more about the Amazing 5 and for lots of delicious Florida OJ infused recipes to try at home! Love using fruit juice to sweeten BBQ sauce!! What a great/innovative recipe. Sounds great, thanks! Well, I usually like Chinese-style orange chicken…so will have to give this a try!